Making infused vodka by steeping it with fruit, vegetables, herbs and spices is a great way to flavor cocktails naturally, but let’s face it- sometimes you just don’t want to wait 4-5 days for Meyer lemon zest to infuse Clique Vodka. The “Insta-fusion” utilizes a much different technique using a cream whipper. By adding pressure to citrus zest in a spirit, the Clique Vodka will be forced into the cells of the Meyer lemon peels for a brief period, causing the lemon oils to flavor it in just a few minutes! Start by removing very thin strips of Meyer lemon peel from 4-5 lemons, using a vegetable peeler. Try to get just the zest, and little to no white pith of the layer underneath. Add them to a 1L stainless steel cream whipper, fill to the line with Clique Vodka, and screw on cap tightly, then turn another 1/4 turn further to ensure a good seal. Load a cream whipper charger (nozzle side up) into the tube and screw on slowly to pierce the cartridge and inject the nitrogen. Shake very well for about 2 minutes, then remove the cartridge cap, dispose of the cartridge and load a second one into the chamber. Screw it back on to inject, then shake for another minute. Let the whole thing sit for about 5 minutes before emptying. To get the finished liquid out of the canister, we will first have to release all the pressure. 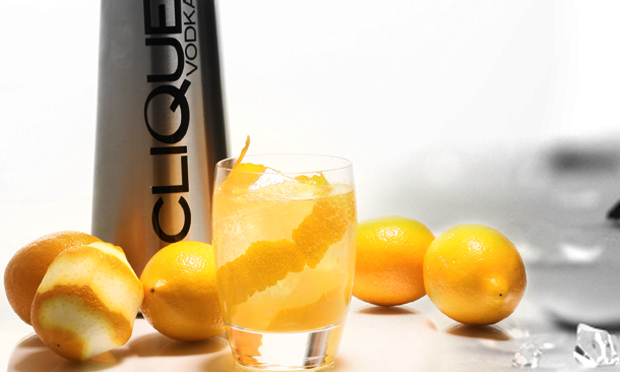 As we do, the dropping pressure inside will allow the Clique Vodka to leak back out of the lemon zest, fully flavored. To do this you’ll need 2 glasses, one held over the nozzle as you squeeze down the lever, preventing liquid from spraying out all over the place. Hold the glass upside down at a 45 degree angle so that anything that sprays out of the upright cream whipped will be caught and drip out. Â Rest the 2nd glass underneath the first glass- ready to Â catch all that precious lemony vodka. Don’t worry if your glasses won’t hold all the vodka- most of the time, the spray of liquid that comes out is minimal, but it never hurts to be prepared. 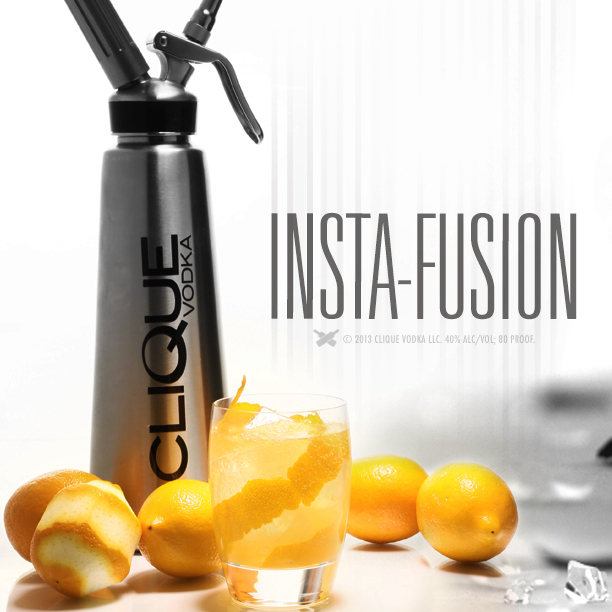 For the “Insta-fusion” cocktail, add 1 1/4 oz lemon Insta-fused Clique Vodka to a glass with ice, and top with soda water. If you don’t have lemons- substitute something else. You can use this same method with all different kinds of fruits, vegetables, and herbs- imagine all the possibilities!